A panoramic view of the Culloden battlefield from Leanach Cottage on right across the moor to the edge of the visitor center at left. Culloden. Here on 16 April 1746 the Jacobite army squared off against an army loyal to the crown and in a battle that raged for less than an hour the future of Scotland was changed. Across the windswept Drumossie Moor more than 1000 Jacobites lay dead while the King’s forces lost as few as 50 men. (Actual casualties for the Jacobites are unknown with estimates ranging from 1 to 2 thousand.) Bonnie Prince Charlie would flee “over the sea to Skye” and live out his life in exile. The clan lifestyle of the Highlands would be dismantled and the wearing of kilts and tartan was effectively banned. The brutal Highland Clearances would follow. Culloden is an oft misunderstood battle and I must admit having fallen victim to one of many misconceptions, that this was a war between the Scots and the English. In truth, while the Jacobite army was made up of largely Highland Gaels, there were lowland Scots, French, Irish, and English fighting for the Jacobite cause, namely the return to the throne of the Stuart king. Likewise there were Scots among the Loyalist troops. Much like the American Civil War to follow, the Jacobite uprising often pitted clan against clan, family against family, father against son. It was a cold and grey September morning when I embarked to visit this historic battlefield, typical Scottish weather many would say. I would later come to think that it was probably the perfect weather in which to visit, for given the almost palpable sadness that permeates the moor, walking about in sun-drenched glory just wouldn’t feel right. My visit to the battlefield was one of many highlights of a week spent in the Inverness and Black Isle region of the Highlands. I had chosen my accommodation, a self-catering flat via Airbnb, in part because of its proximity to Culloden and another of my destinations, historic Fort George where I was a guest at the Highland Military Tattoo. Initially I could not fully appreciate the “proximity” of my accommodation. From the fenced back garden I could see the tourist busses in the car park of the Visitor Center. On arrival I literally drove up onto the “Cumberland stone.” It was at the end of the street and around the corner from my holiday flat. Legend says it was from atop this large flat stone that the government commander, the Duke of Cumberland, stood and observed the battlefield. While there is no historic proof that this is “the” stone it is the only one in the area and is positioned properly, though trees and the Culloden Moor Inn now block any view. My Airbnb accommodation is circled in red. 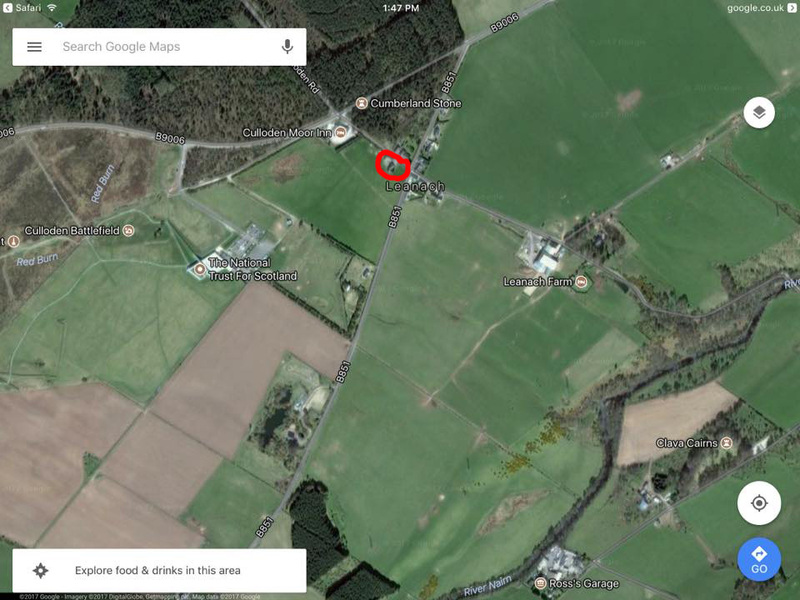 Note the location of the nearby Cumberland stone, the Culloden Moor Inn, and the NTS Visitor Center. 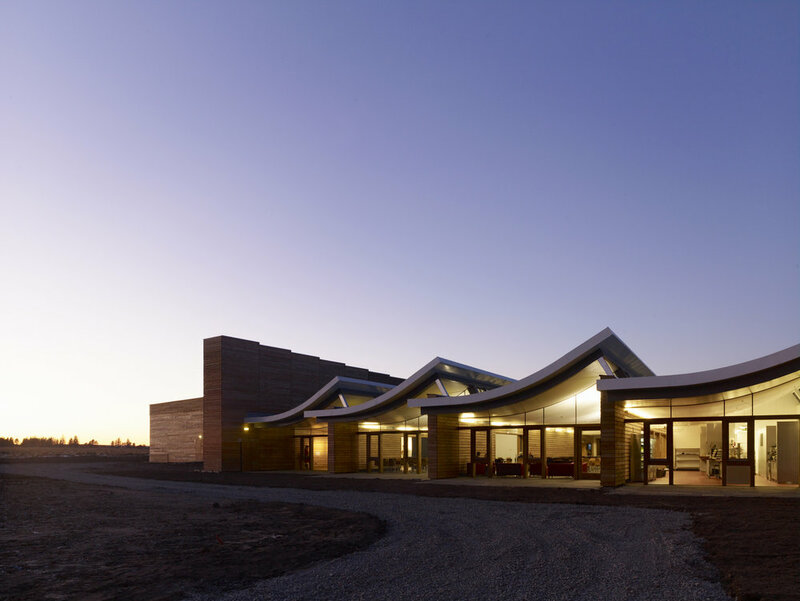 Visitors to Culloden are first greeted by a purpose built Visitor Center. 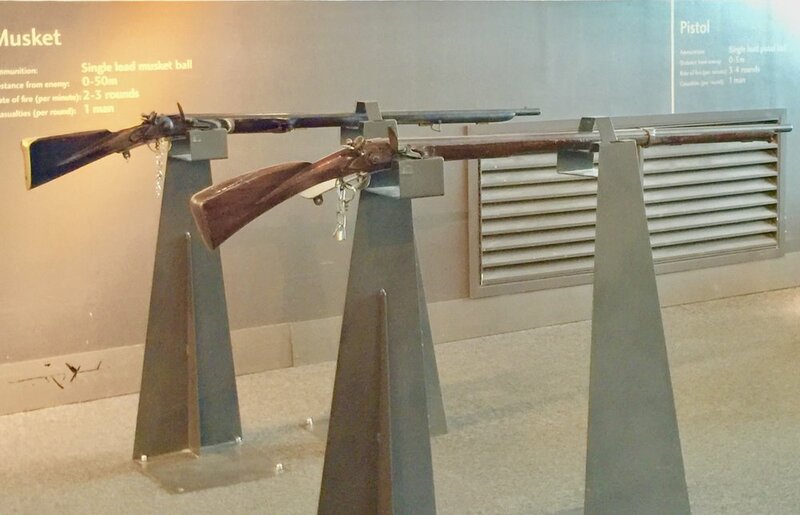 Opened in 2007 the center was constructed after archeological research in 2004 and 2005 had proven the then visitor center had been built across the position of the government troops second battle line. Inside, the center is designed so that you follow a dual time line leading up to and through the battle that simultaneously tells the Jacobite and Loyalist sides of the story. 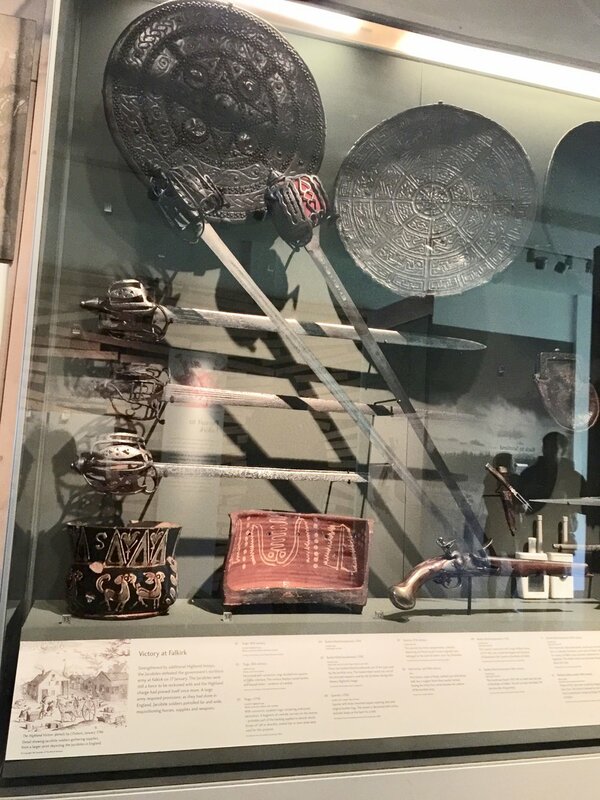 The display of artifacts is impressive, including weaponry, clothing, coins and other artifacts. Not to be missed is the brief “full immersion” film reenactment of the battle - essentially an empty theatre where you stand and the film is shown on the four walls surrounding you and allowing you to experience the battle from varying viewpoints. It reminded me of the old CBS-TV series “You Are There” (with apologies to younger readers). Another attention grabbing display is a sort of oversized interactive electronic game board where you can see the battle unfold with the graphic movement of troops and the corresponding timeline. Throughout the center the story lines are color oded - red for the Loyalists and blue for the Jacobites. From the visitor center you exit onto the battlefield. There a series of paved foot paths allow you to tour the battlefield at your leisure or you can join a group guided by one of the one site docents. These path’s are marked with flags to mark the positions of the two armies, again red for the Loyalists and blue for the Jacobites. It’s along these paths where you will encounter the stones that mark the known mass graves of various clans. My Breckenridge Scot ancestry has me as a member of a sept of Clan Douglas and the clan archives say very few Douglases were present at Culloden. Of far more interest to me then were two other battlefield “markers,” the memorial stone cairn and Leanach cottage. Footpaths allow visitors to walk the battlefield. 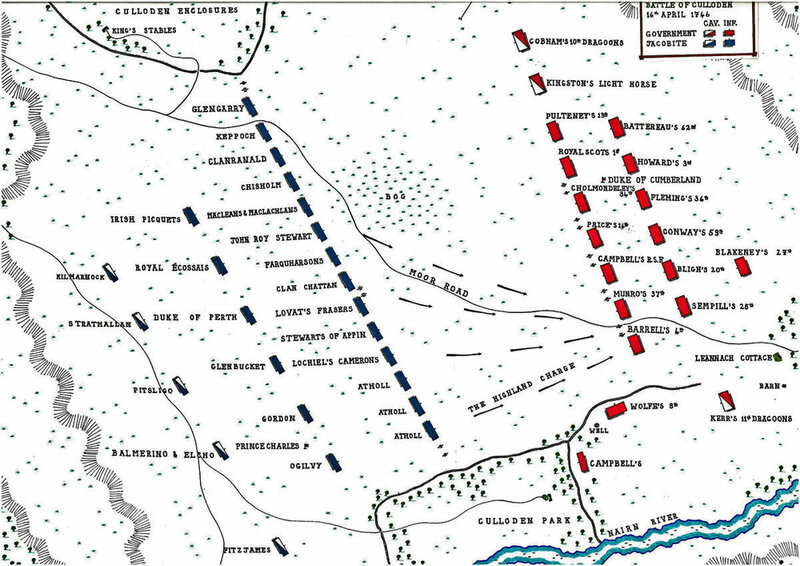 Battle lines are marked with flags, red for Loyalist troops, blue for the Jacobites. Ironically I found myself visiting Culloden the very week in September when the new season of the Starz TV drama “Outlander” was premiering. In the opening episode Jamie is seen taking refuge with a group of other Jacobite survivors/prisoners. I could not help but overhear other battlefield visitors discussing that Leanach cottage was “the” house where these survivors had taken their refuge. In fact, during the battle this cottage stood between the government troops first and second lines and was likely used as a field hospital for them. History says it was a barn belonging to the cottage that was later set afire and in which several Jacobite survivors were burned alive - one of many post battle atrocities attributed to “the butcher” Cumberland and his order that no quarter be given. Today the cottage stands alone as the sole survivor of a type of tenant Croft dwelling that were spotted across the area. After the battle there were intermittent periods during which the cottage was both occupied and vacant. The National Trust for Scotland was gifted the property in 1944 and it served as an initial rudimentary visitor center. It is said that the family of the last resident, Belle MacDonald, who died in 1912, had often given visitors tours of the battlefield. At one time visitors were allowed inside though it is now closed, but there are hopes it may soon again be opened for viewing. A short distance from the Cottage is the memorial cairn. This stone memorial was erected in 1881 by Duncan Forbes who also placed the headstones that mark the various clans’ graves. An interesting comment read on social media recently was that of someone complaining that the clan Fraser marker gets all of the visitor attention these days because of the popularity of the Stars TV drama “Outlander.” The commenter obviously felt the other clan memorials were being snubbed. This 20 foot tall stone cairn was erected in 1881 by then Laird of Culloden, Duncan Forbes. He was also responsible for placement of the various clan headstones that mark the mass graves of the fallen Jacobites. The grave(s) of the Loyalist troops remain unmarked. One of many clan headstones placed in the 1880's by Duncan Forbes. 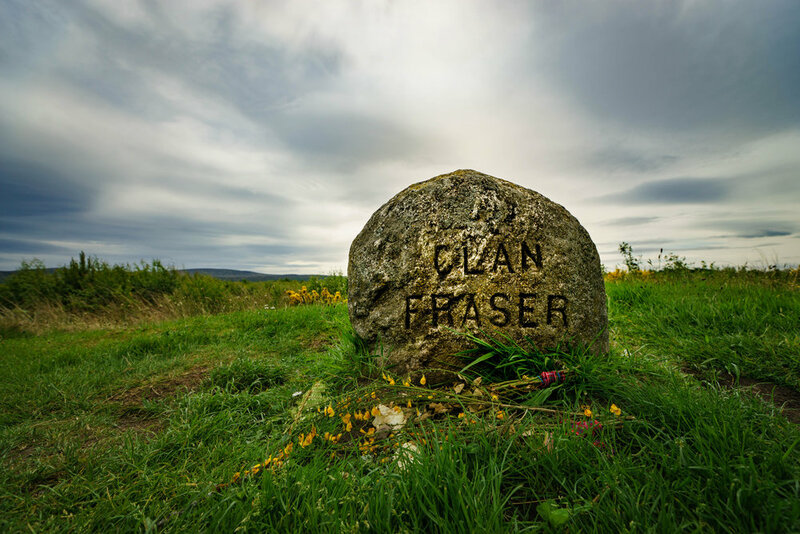 Because of the popular Starz TV drama "Outlander" and it's fictional lead character Jamie Fraser, this marker is often surrounded by visitors to the extent of complaints other clans are being ignored. Back in the visitor center I took a seat to contemplate all I had seen and learned. The day’s weather fit the mood for I felt a deep sense of sadness here. Culloden signaled the end of the Highland clan society. 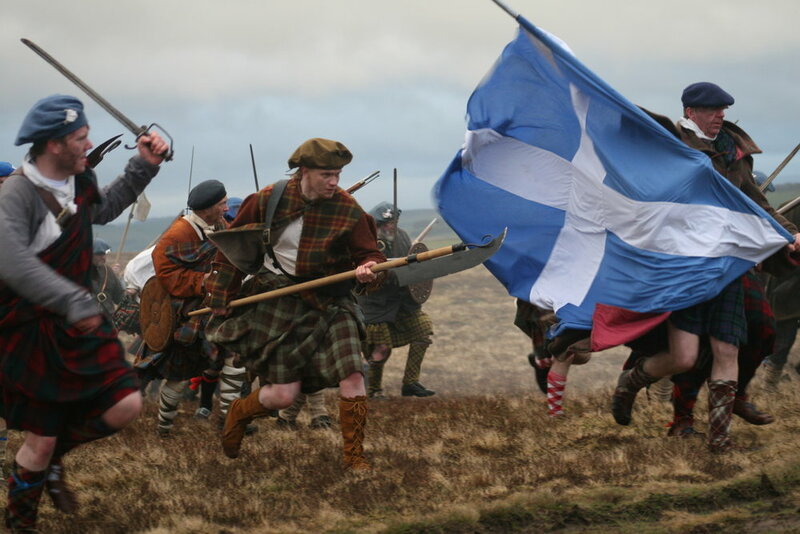 The aftermath of the battle was especially cruel, not only to the surviving Jacobite combatants but to the people at large as the government stripped away land titles, arms, and the right to wear traditional Highland dress, namely tartan and kilts. I also couldn’t help but find similarities between Culloden and other historic battlefields I’ve visited. At The Little Bighorn, although a victory for native Americans, it signaled the end of their great nomadic culture, just as the Highland clan society was dismantled by Culloden. At Gettysburg there is the spot on the battlefield where the Confederate charge reached Union defenders and fierce hand-to-hand combat resulted, just as at Culloden. At Normandie, where the invading Allies had to battle the topography of the beaches and dunes while facing withering fire from the Germans, similarly the moor's terrain forced the Jacobites to alter the path of their charge while under heavy artillery fire from the government troops. And, at The Alamo, in my home state of Texas, where a weary band of men fought unto the death against overwhelming odds for freedom from an oppressive government rule. 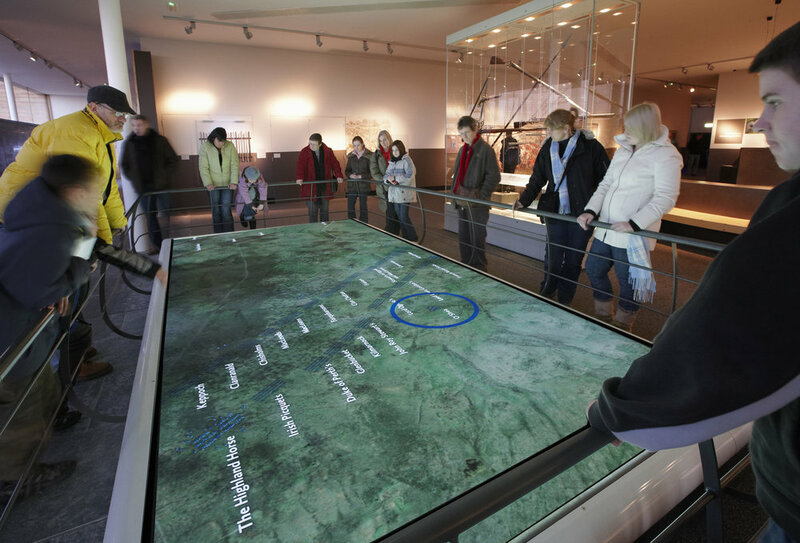 Be prepared to spend some time at Culloden, it is not to be visited quickly, 2-4 hours I would think would be average. Within the Visitor Center is a gift shop and cafe for relaxing after your tour. Two special notes... the battlefield has been in the care of the National Trust for Scotland since 1944 and members enjoy free entry. I simply showed my NTS USA membership card and was warmly welcomed. For those with limited mobility there are a few electric scooters available free of charge. Over the decades the battlefield has evolved from what it was at the time of the battle. Heather and scrub brush has overtaken some of the native moor once used as a common grazing land for tenants of the Culloden estate. Trees have been felled revealing even more of the battleground. Archaeologic discoveries have redefined the conservation zone boundaries too. 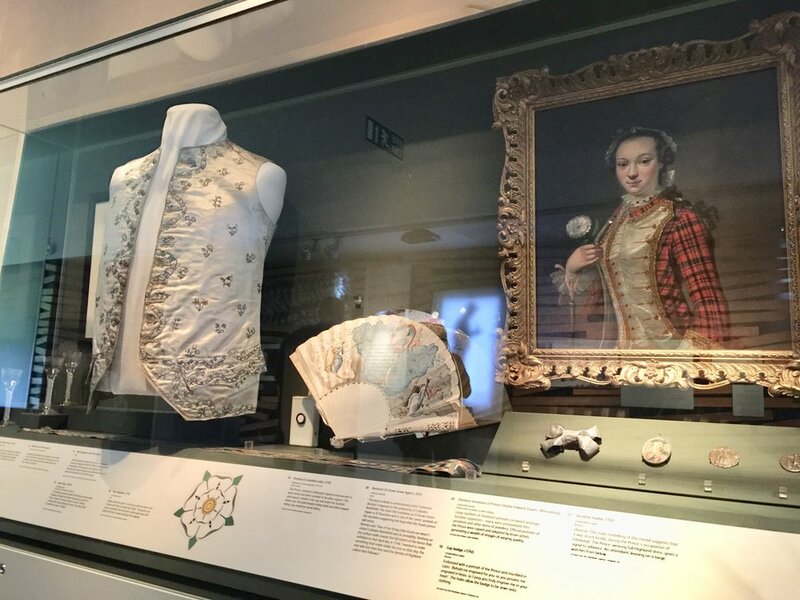 The "Outlander" effect has been widely reported as having a positive impact on Scottish tourism with visitors from around the world traveling there to see locations used in filming the TV series. 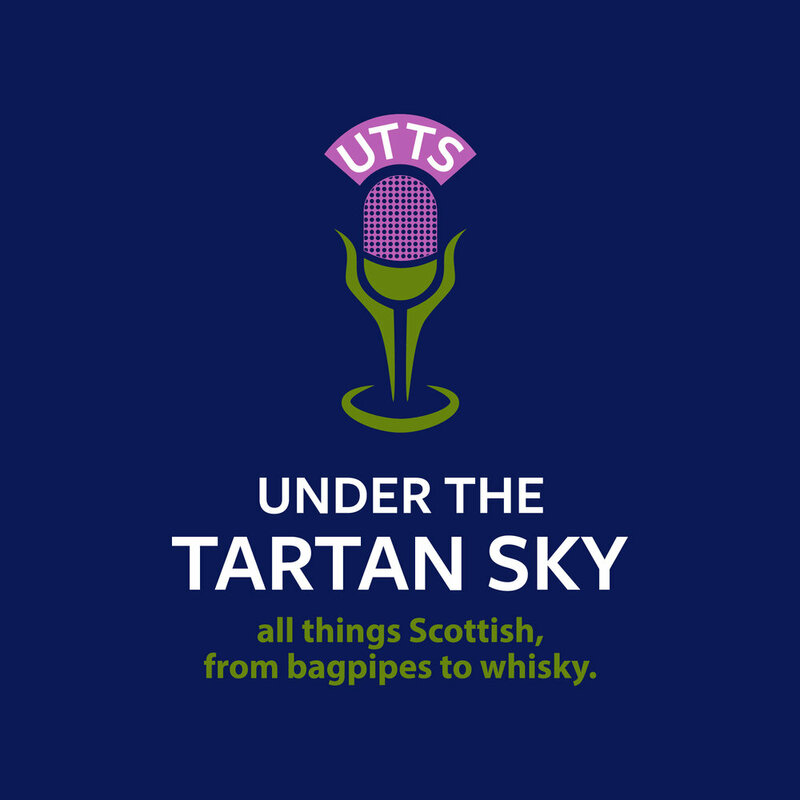 The series has also broadened the appeal of Scottish history around the world. Culloden has unquestionably felt the benefit of this effect, but the battlefield is not a TV set, it is real. The men who fought and died here were real. The sacrifice they made is all too real. Culloden marks a significant turning point in history and it should be visited, studied, appreciated, and preserved as such.